The fun comes and goes depending on the shoes. If your feet do not feel comfortable and are full of bruises and blisters your tour might be pretty much spoiled. After all, shoes for men are the base of any outdoor equipment. That is why high-end outdoor shoes for men are a must. Nowadays, any super market has outdoor shoes for men on offer but you should not let the cheap offers deceive you. Good outdoor shoes for men may be pricy but they offer high quality and durability in exchange. With the right outdoor shoes for men your outdoor sports adventure can begin immediately. There are many models of shoes for men, so it is easy to lose track. But do not lose heart. A suitable pair of outdoor shoes for men can be found quickly. 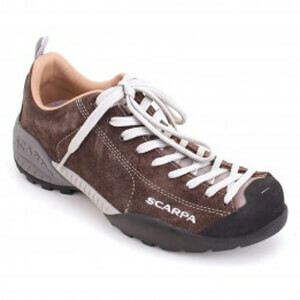 If you know for which activity you need the shoes for men, you will come across the right model quickly. But which outdoor shoes for men are suitable for which purpose? The perfect shoe for men when it comes to hiking are, of course, hiking shoes. These shoes for men support your feet and are made for long walking distances. Approach shoes are recommended for all climbing enthusiasts. These shoes for men are perfect for approaching your climbing spot. The grippy tread helps you overcome rough terrain and boulders. On a mountain hike or a via ferrata you should go for trekking boots. They are perfectly adapted to the terrain on mountains and partly crampon-compatible. These shoes for men will take you to the top any time. When the winter comes you should pick winter boots. These shoes for men are well insulated and keep your feet pleasantly warm. A non-slip sole provides you with step security on snow and icy ground. You can not enjoy returning to your hut after a long day of outdoor activities without slippers. These extremely comfortable shoes for men allow your feet to take a break after all the physical effort. A fluffy lining provides you with warmth and relaxation. That is a nice way to bring the day to an end. Outdoor shoes for men will not let your feet down! Seek and you shall find! As you can see there is an almost unlimited variety of outdoor shoes for men. In addition to the shoes already mentioned for men there are a lot of other models such as trail running shoes, hiking shoes, expedition boots and many more. In combination with the right outdoor socks your feet are perfectly equipped.Lace up your outdoor shoes for men and let the wild outdoor adventure begin!